A new song- 'Tere Jaisa Tu Hain' from upcoming Bollywood film 'Fanney Khan was released on Monday. The song focuses on the struggles of a teenager, played by newcomer Pihu Sand. 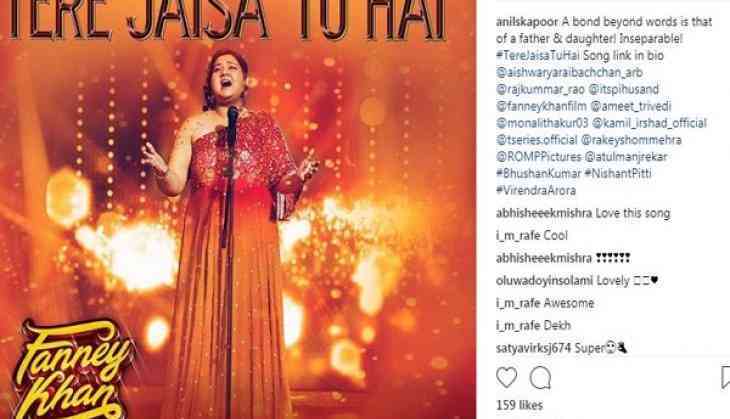 Actor Anil Kapoor, who plays Pihu's father in the film, took to Instagram to reveal the new song. He posted a photo of Pihu's character singing on a stage wearing a red one-shoulder gown. He captioned it, "A bond beyond words is that of a father & daughter! Inseparable! #TereJaisaTuHai Song link in bio ? @aishwaryaraibachchan_arb @rajkummar_rao @itspihusand @fanneykhanfilm @ameet_trivedi @monalithakur03 @kamil_irshad_official @tseries.official @rakeyshommehra @ROMPPictures @atulmanjrekar #BhushanKumar #NishantPitti #VirendraArora"
The montage song tracks the struggles of Pihu's character, who is out in the cruel world trying to making a name for herself in the music industry but is called out time and again for being 'overweight'. The very begining of the song shows her being rejected during a stage performance. Anil Kapoor as the father and Divya Dutta as the mother, are shown to be very supportive of their daughter. The song shows how they are a part of the sad and the happy moments of their child's journey to success. Inspite of being high on emotions, the song ends with a positive message, which reads, "A Dream never dies". 'Fanney Khan' is a one of its kind musical comedy, revolving around a father who wishes to fulfill his daughter's dream of becoming a singer. The film is directed by Atul Manjrekar; and stars Aishwarya Rai Bachchan, Rajkummar Rao and Anil Kapoor, in lead roles. It is slated to hit the screens on August 3.